An outcome measure is a tool used to assess a patient’s current status. Outcome measures may provide a score, an interpretation of results and at times a risk categorization of the patient. Prior to providing any intervention, an outcome measure provides baseline data. The initial results may help determine the course of treatment intervention. Once treatment has commenced, the same tool may be used in serial assessments to determine whether the patient has demonstrated change. With the move towards Evidence Based Practice (EBP) in health care, outcome measures provide credible and reliable justification for treatment on an individual patient level. The results from outcome measures may also be grouped for aggregated analysis focused on determining quality of care. When outcome measures are used in an aggregated data situation to compare results, a risk adjustment process is required to fairly compare results. Self-report measures are typically captured in the form of a questionnaire. The questionnaires are scored by applying a predetermined point system to the patient's responses. Although self-report measures seem subjective in nature, self-report measures objectify a patient's perception. Historically, the questionnaires required that either a therapist interviewed the patient or the patient independently completed the questionnaire. Self-report outcome measures that use paper and pencil for completion are considered a fixed-form questionnaire. Computer based or electronic self-report measures are available. Electronic measures may be fixed-form or adaptive. Computerized adaptive testing is a method of testing that determines the questions for a response based on the patient's previous responses. The questionnaires where the patient reports on health or physical function are known as patient-reported outcomes (PRO). PROs can be categorized as disease specific or generic. PROs have been defined as "any report of the status of a patient's health condition that comes directly from the patient, without interpretation of the patient's response by a clinician or anyone else." Performance-based measures require the patient to perform a set of movements or tasks. Scores for performance-based measures can be based on either an objective measurement (e.g., time to complete a task) or a qualitative assessment that is assigned a score (e.g., normal or abnormal mechanics for a given task). Observer-reported measures are measurements completed by a parent, caregiver or someone who regularly observes the patient on a daily basis. Clinician-reported measures are measurements that are completed by a health care professional. The professional uses clinical judgement and reports on patient behaviors or signs that are observed by the professional. Important features of an outcome measure that need to be taken into account when using an outcome measure are its psychometric properties. Psychometric properties are the intrinsic properties of an outcome measure. Ideally, the psychometric properties of an outcome measure used in practice should have been developed and tested through a series of research studies. These properties include validity, inter-rater reliability, intra-rater reliability, responsiveness, ceiling effects, floor effects and minimal clinically important difference. Validity refers to the how accurately the test actually measures what it is supposed to measure. High validity means the measure is consistently stable in its ability to measure its intended focus. Inter-rater reliability takes into consideration the consistency of the results of the measure when two different people are evaluating the results of a common subject. With performance-based measures, if two physiotherapists scored the performance, high inter-rater reliability would mean that both determined similar scores on the performance evaluated. For patient reported outcome measures, a high intra-rater reliability indicates that the patient consistently responds to attain the same results. (This would be more relevant with serial testing and no intervention or change in status. Intra-rater reliability falls under test-retest reliability.) Responsiveness refers to the ability for the measure to be able to capture change in status. Ceiling effect occurs when the majority of patients are able to complete the measure and score within the highest range of the measurement. (The test is too easy and is not capturing their full capability.) Floor effect occurs when the majority of the patients score within the lowest range of the measurement. (The test is too hard and does not have enough easier items to distinguish varying levels of status.) When determining if change is relevant, the p-value has no value. For outcome measures, the clinician needs to know the minimal important difference. Minimal important difference refers to the amount of change that is relevant from the patient's perspective. (clinical meaningfulness). Choosing appropriate outcome measures for your patients is critical to understanding their status and progress over time. Orthopaedic Scores: a free outcome measure calculation service for certain orthopaedic outcome measures. Rehabilitation measures database: developed to help clinicians and researchers identify reliable and valid instruments used to assess patient outcomes during all phases of rehabilitation. Patient-Reported Health Instruments: includes over 8,600 records with keyword search capability. Outcomes Measurement Information System: PROMIS: provides a web-based repository of valid and reliable PRO measures of health concepts relevant to clinician and researchers. CEBP: Centre for Evidence Based Physiotherapy: provides an extensive database of physiotherapy outcome measures. The Neurology Section: recommendations for outcome measures used in neurological clinical practice, research and education. 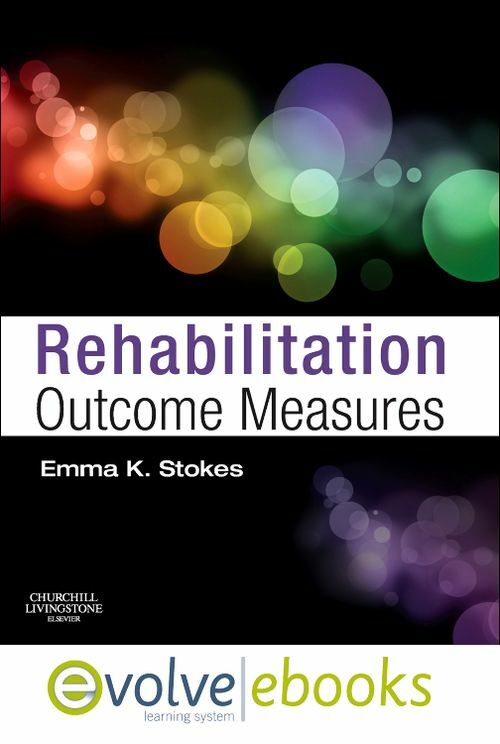 Rehabilitation Outcome Measures is a comprehensive review and comparison of measurement instruments in rehabilitation. It includes a high-level section on professional practice in physiotherapy and an introduction to the World Health Organisation’s (WHO) International Classification of Health. For those who wish to learn more about the relevance of reported measurement properties, the text focuses on how this knowledge can assist clinical decision-making. Additionally, the book reviews a range of measurements in neurological rehabilitation as well as mobility, fatigue, physical activity and patient satisfaction. ↑ Gvozdyev BV, Carreon LY, Graves CM, Riley SA, McGraw KE, Head RJ, Dimar JR, Glassman SD. Patient-reported outcome scores underestimate the impact of major complications in patients undergoing spine surgery for degenerative conditions. Journal of Neurosurgery: Spine. 2017 Oct 1;27(4):397-402. ↑ Deutscher D, Werneke MW, Hayes D, Mioduski JE, Cook KF, Fritz JM, Woodhouse LJ, Stratford PW. Impact of risk adjustment on provider ranking for patients with low back pain receiving physical therapy. Journal of Orthopaedic & Sports Physical Therapy. 2018 Aug;48(8):637-48. ↑ McCabe E, Gross DP, Bulut O. Procedures to develop a computerized adaptive test to assess patient-reported physical functioning. Quality of Life Research. 2018 Sep 1;27(9):2393-402. ↑ Kyte DG, Calvert M, Van der Wees PJ, Ten Hove R, Tolan S, Hill JC. An introduction to patient-reported outcome measures (PROMs) in physiotherapy. Physiotherapy. 2015 Jun 1;101(2):119-25. ↑ Black N. Patient reported outcome measures could help transform healthcare. BMJ: British Medical Journal. 2013;346. ↑ Bean JF, Ölveczky DD, Kiely DK, LaRose SI, Jette AM. Performance-based versus patient-reported physical function: what are the underlying predictors? Physical Therapy. 2011 Dec 1;91(12):1804-11. ↑ Hefford C, Abbott JH, Baxter GD Arnold R. Outcome measurement in clinical practice: practical and theoretical issues for health related quality of life (HRQOL) questionnaires. Physical Therapy Reviews. 2011;16(3):155-167.